Major, 147th New York Vol. Inf. Born in New York City, Feb. 12, 1841. 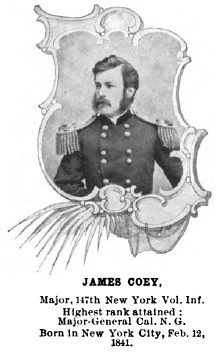 The Third Brigade, Third Division of the Fifth Army Corps, to which Major James Coey’s command, the One hundred and forty-seventh New York Infantry, was attached, advanced over an open field, under a heavy fire from the enemy, who were entrenched in a wood. The brigade line of battle reached to the edge of this wood, but owing to the fierce fire it refused to advance farther, and lay down, seeking shelter on the ground. The brigade commander, General Henry A. Morrow, placed himself in front of his command and implored the line to move forward, but the effect of the enemy’s fire had been so appalling that the men hesitated. The situation was most critical, because the brigade adjoining Morrow on his right was also sorely pressed and its line in danger; General Crawford, the division commander, was urging Morrow’s advance, hoping to draw the fire from the right front and relieve the pressure there, but the lines had become terror-stricken. It was at this moment that Major Coey, who had, by word and action, been seconding General Morrow’s efforts to advance the line and hold it to its duty, seized the colors of his regiment and advanced with them. The effect was magical! Color after color was taken until the entire brigade line was on its feet and with a cheer advanced into the woods to within a few rods of the enemy’s works. Here its farther advance was stopped by a wide and deep ditch filled with water. Major Coey communicated the situation to General Morrow, now in the rear of the line, who, seeing the fast thinning ranks of his command, and the hopelessness of advancing, ordered the line back to the edge of the wood, there to entrench. The major then called the attention of the brigade commander to the lack of ammunition, hardly five rounds to a man being left, whereupon General Morrow ordered the brigade to meet any advance of the enemy with the bayonet and go on entrenching. Coey immediately ordered the men to obtain cartridges from the dead and wounded lying along his front, and to make obstructions to retard the enemy’s advance by bending and intertwining young saplings. In this work he was setting his men an example, when the Confederates, now reinforced by artillery, opened a fierce and destructive fire, and made a spirited advance on the front and flank, driving the Union line back. At this juncture Major Coey was severely wounded—a bullet entering below the left eye and passing out behind the right ear—and was being borne from the field in the arms of two comrades when consciousness returned. Immediately he procured a horse from an ambulance sergeant, and being lifted into the saddle and held there by two of his men he turned to the line and, rallying it, for the second time made a heroic attempt to check the advance of the enemy. Private, Co. D, 8th Pa. Cav. Born at Valley Forge, Pa., 1842. 1st Sergt., Co. G, 88th Pa. Inf. Sergeant, Co. H, 13th Pa.Cav. Born in Montgomery Co., Pa. Private. Co. K, 210th Pa. Inf. Born at West Laurens, N. Y., May 20,1844. Sergeant, Co. D, 107th Pa. Inf. Born in Ireland, April 22, 1848. Four times on this day the One hundred and seventh Pennsylvania Infantry, to which Sergeant John C. Delaney belonged, had charged on the enemy’s works, and each time had been beaten back. In each of these charges many brave men fell close to the enemy, who were thoroughly protected behind impregnable fortifications, but Sergeant Delaney had the wounded of Company I, his own company, and Company D, which was also under his command, carried back, so that none were left between the lines. It was when his regiment had been forced back for the fourth time that Sergeant Delaney found himself up against the line of entrenchments that had been hastily thrown up by the Federal troops. The momentum of the backward movement had been so great that he could not check himself until the wall of earth stopped his run. There he stood, surrounded by wounded men belonging to Company D, and heard his name called on all sides by its members begging to be helped off the field. The whole regiment had reached the safe side of their line of works, while he alone stood outside facing the enemy, with the pitiful appeals of the wounded ringing in his ears, and the bullets falling like hail around him. To add to the horror of the situation he now noticed that the dry leaves and underbrush had caught fire and that it was only a question of a few minutes before the wounded men would be burned alive. Rushing to the surviving members of Company D, he appealed to them to assist in saving their wounded comrades; but to his surprise and dismay they refused, several saying that it would be certain death to make the attempt. They begged him to get over the works, convinced that he would be riddled with bullets, or worse, burned alive. The sergeant then appealed to his own men, but not one of them would venture in that shower of lead. Alone he rushed out, picked up a wounded soldier much heavier than himself and started back, reaching the line of works, where many willing hands were stretched out to help lift the wounded man over. The sergeant’s splendid example made such an impression on his comrades that several were now willing to join him in the perilous work, and in a short time all the wounded had been brought in; but scarcely were the rescuers over the line when every foot of ground was in flames. Several of the men were wounded while struggling with their burdens, and they in turn had to be rescued from the fire, each unfortunate thus saved adding to the glory of his comrades. 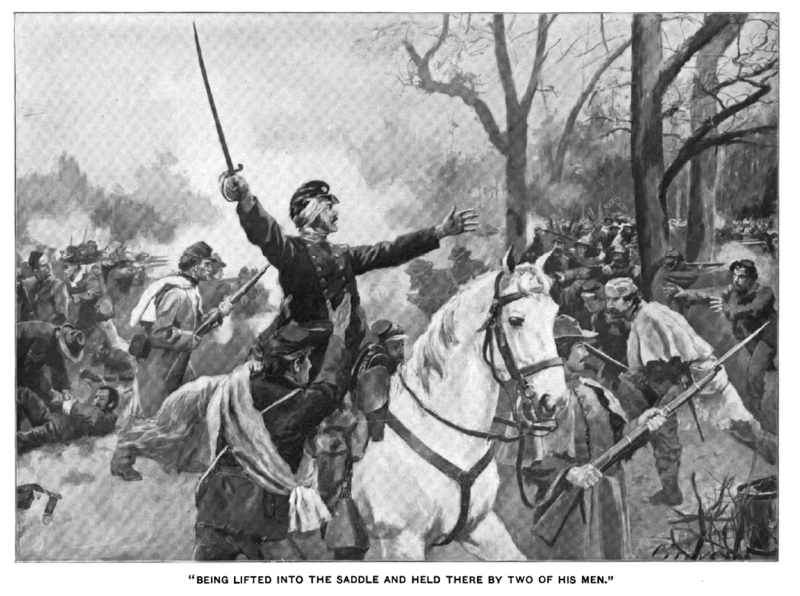 The Thirteenth Pennsylvania Cavalry, which was stationed at Hatcher’s Run, accomplished one of the most gallant charges of the day. With drawn sabres the line swept down upon the Thirty-third North Carolina Infantry, and a severe hand-to-hand fight followed. Sergeant Daniel Caldwell, of Company H, charged upon the color-guard, and knocking aside the bayonets ready to receive him, he seized the colors. Upon turning about to rejoin his regiment he espied a rebel officer and his staff coming toward him. Not waiting for them to charge him he put spurs to his horse and dashed at them. The next moment he was seen slashing and parrying with his sabre in his right hand, while with his left he managed his horse and retained the captured flag. A few severe strokes and he had cut a path through the enemy and safely regained his regiment. While the battle was raging on the 5th [of February 1865] the Two hundred and tenth Pennsylvania Infantry was close to the scene of action, but did not reach the battle field until noon of the 6th. Shortly after noon it reached a position on the extreme left of the line of battle and at once pressed forward, driving the enemy quite a distance through the woods until they reached their reserve line, stationed on a low ridge. Here the rebels fought with renewed energy and, with the additional hail of lead from their reserve poured into the Union troops, the Federal line began to waver, then gradually fall back. One of the regiments of the brigade was thrown into utter confusion and its color-bearer killed. Private Charles Day, of Company K, Two hundred and tenth [Pennsylvania] Regiment, ran to the fallen colors and, picking them up, carried them throughout the remainder of the battle. After having engaged the enemy’s cavalry and also capturing a wagon train, on the 5th, Gregg’s Cavalry Division, without rest of any kind, confronted the enemy again on the 6th. Although the men had now been in the saddle for nearly twenty-four hours there was no hesitation when the charge was sounded to repulse a sudden heavy assault of the enemy on an infantry division. Having accomplished their task, they held the line, dismounted, until the infantry had returned, when the rebel skirmish line was driven to the edge of the clearing, where within two hundred yards was a line of rebel works. The fire from these was very heavy, particularly from a party of sharpshooters in a house within the works. 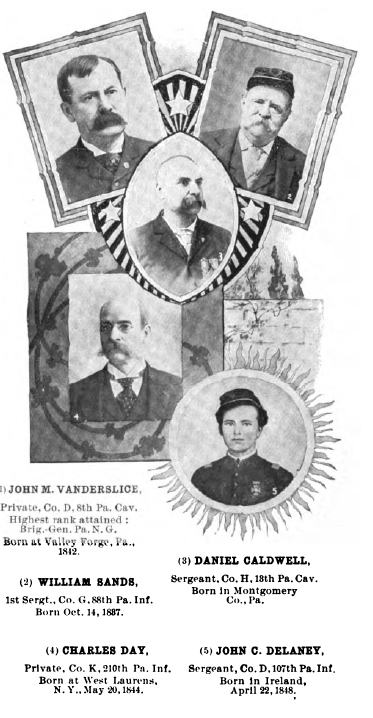 Orders were given for a general charge, and at the sound of the bugle the line dashed forward, carrying the works, which were first entered by Private John M. Vanderslice, of Company D, Eighth Pennsylvania Cavalry, whose speedy horse carried him far in advance and made him the leader of the line, in which position he received the undivided attention of the rebels. Assistant Surgeon Jacob F. Raub, of the Two hundred and tenth Pennsylvania Infantry, was one of the board of operating surgeons of the field hospital of the Fifth Army Corps, established in the rear and beyond the reach of rebel shot and shell, but when he learned that his regiment was without a surgeon he volunteered to accompany it in the fight and obtained permission from the surgeon in charge of the field hospital to do so. While attending to the wounded under a severe fire, he discovered a strong column of the enemy stealing by the left flank to the rear of the Federals. The whole division was heavily engaged at this time, and no enemy was expected or supposed to be in that direction. Raub, realizing the imminent danger of an attack on flank and rear, ran forward under a severe fire and apprised General Ayres and General Gwyn of the threatened danger. This prompt and intelligent action gave time to change the direction of part of Gwyn’s brigade to meet the flank attack, and severely repulse the enemy. During the excitement of the repulse Surgeon Raub, though a non-combatant, took the musket and ammunition from a wounded soldier and fought gallantly in the ranks until the end of the engagement. During one of the charges of the Eighty-eighth Pennsylvania Infantry, First Sergeant William Sands, of Company G, was in advance of his company and in the face of a deadly fire he grasped the enemy’s colors and brought them into the Union lines. First Lieutenant Francis M. Smith, adjutant of the First Maryland Infantry, voluntarily remained behind with the body of his regimental commander under a heavy fire after the whole brigade had retired, and brought the body off the field. Corporal John Thompson, of Company C, and Corporal Abel G. Cadwallader, of Company M, of the same regiment, planted the national and state flags on the enemy’s works in advance of the regiment’s arrival. Hatcher’s Run and Dabney’s Mills.— Early in February, 1865, a second attempt was made to gain possession of the South Side Railroad, near Hatcher’s Run, which resulted in the battle of that name and included the actions at Dabney’s Mills, Rowanty Creek, and Gravelly Run. The battle began February 5th and lasted until the 7th, when the Confederates were forced to retire with a loss of 1,000 and their commander, General John Pegram. The Union loss was 2,000, the greater portion of which belonged to Crawford’s Division, which was driven back by the Confederates in great confusion.